This entry was posted in Environment & Resources, Statistics on 10th March 2019 by Brian Easton. Summary:. Methane (CH4) is a greenhouse gas. Some methane comes from atmospheric carbon-dioxide which is fixed in grass, eaten by livestock, belched into the atmosphere and eventually returns to atmospheric carbon-dioxide. Before it breaks down, the methane molecules form a ‘cloud’ in the atmosphere which adds to global warming at a much higher rate per carbon molecule than does a carbon-dioxide molecule. New Zealand’s carbon emission accounts include methane emitted from livestock. However, in them methane is currently measured as a gross emission, rather than as a net addition to the cloud, which allows for the fact that past methane emissions are breaking down. When this is included it seems that New Zealand’s net contribution to the methane cloud is much smaller than as recorded on a gross basis. Even so, New Zealand should be aiming to reduce its methane emissions too as a contribution to reducing global warming. This paper does not address other sources of methane (which may be subject to a similar analysis) nor that there are other greenhouse gases emitted by farming, such as nitrous-oxide. A column commentary on this report is here. We have estimates of the gross methane emissions from livestock going back to 1800 (effectively from the beginning because there was no livestock in New Zealand much before that date). 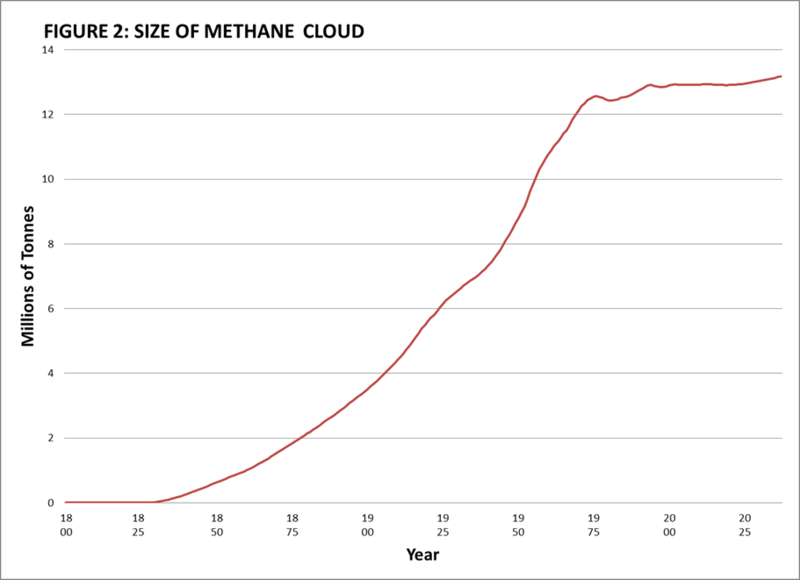 Projections of the size of the methane cloud to 2050 are based on current forecasts of the gross emission rate. The pattern is shown as the blue line in Figure 1. There is a fairly steady growth of emissions to the late 1960s – say of 4 percent a year. After that, the rate of gross emissions is almost flat. The methane is measured in millions of tonnes (MTs). (Later, when being compared to other sources of global warming it will be measured in million tonnes equivalent of CO2 (MTEs) for which a tonne of methane is multiplied by about 25, reflecting at its greater contribution to global warming than carbon-dioxide.) 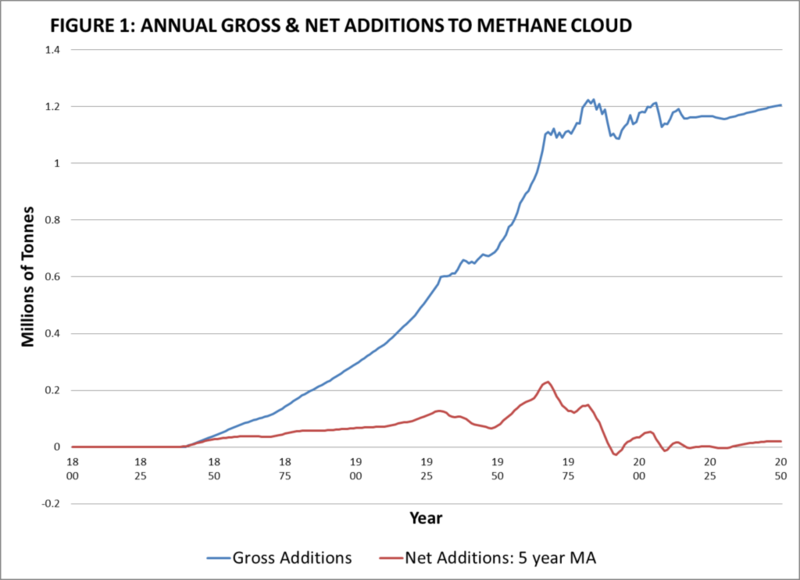 The red line shows net additions to the methane cloud. It is explained below. NAMC: Ressinger (2018) and figure 2 as explained in and derived in text. Once in the atmosphere the methane breaks down into carbon-dioxide at a rate of about 9 percent a year, thereby diminishing the size of the methane cloud. Meanwhile the cloud size is being increased by new emissions. We use a perpetual inventory method to calculate the size of New Zealand’s methane cloud. Essentially it involves adding the annual gross methane emissions to the cloud at the beginning of the year which is depleted by 9 percent for the methane molecules which have returned to the atmospheric carbon-dioxide from whence they came. Figure 2 shows the size of New Zealand’s livestock methane clouds since 1800 measured in MTs. .It, too, shows a steady growth up to the early 1970s and then there is a flattening out. Source: Derived from Figure 1 as explained in text. It makes sense to measure New Zealand’s livestock methane impact on global warming in terms of NAMC rather than GAMC terms, just as we measure the carbon sink in trees by deducting the carbon released from their harvesting from the carbon absorbed in growing trees. The methane cloud is a kind of ‘anti-sink’ – a negative forest. Figure 1 also shows – in red — NAMC together with GAMC. (The net series is a five-year moving average to soften some of the year to year volatility. Including only net additions to the methane cloud dramatically changes the picture cutting back New Zealand’s contribution to atmospheric carbon by over half and reducing the role of the agricultural sector substantially. One consequence is that New Zealand is not as relatively high in the international pecking order of per capita carbon emissions as is sometimes claimed. Other years show a different net balance. Not every year since 1990 has had negative NAMC. But positive or negative, their effect is small compared to overall emissions. This paper is an exercise in improving measurement. Policy responses need not immediately follow from it. For instance, there is nothing in this paper which implies that New Zealand should desist from seeking to reduce its carbon emissions. However, a couple of comments may be relevant. In 1990 (the first year for which we have detailed records) New Zealand’s aggregate carbon-equivalent emissions (after allowing for methane breakdown) amounted to about 2.7 MTEs. In 2016 (the last year for records) they were 21.9 MTEs, about eight times as much. Most sectors contribute to the rise (waste is an exception) but there has been two major contributors. First, energy emissions are about 30 percent higher. Second, land use, land-use change and forestry are absorbing about 25 percent less carbon in 2016 than they were in 1990. Methane hardly comes into the equation. Acknowledgments: I am grateful for assistance from and discussions with Andy Reisinger, John Carrad, Elizabeth Caffin, Alan Gray, Suzi Kerr, Jacqueline Rowarth and David Young.